Those of you who read my blog already know that my skin isn't in the best condition at the moment. I've been looking for a solution to this problem, and I think I have found a couple of true gems. I've been using these products for about a month now. My skin isn't perfect yet, but these products have helped it come a pretty long way! 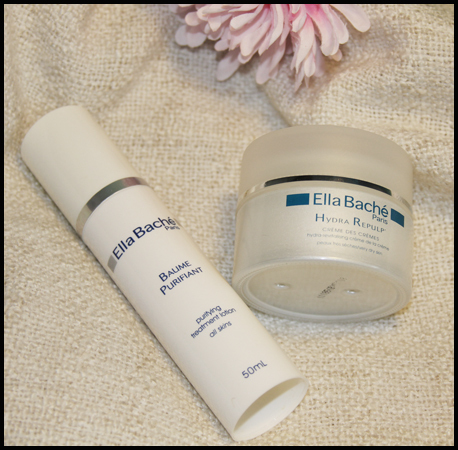 I first learned about Ella Baché when I was sent for a skin analysis at their counter at David Jones. Charlotte, the woman who did the analysis, was very knowledgeable and well-versed with Ella Baché's products. She used a light with a magnifying glass on my skin which she said enabled her to analyse my skin without me having to remove my makeup (big plus!). I told her about my acne issues and she was able to diagnose the problem (too oily, not enough hydration) and prescribe a myriad of products that would help. If you go to the Ella Baché website, you'll notice that in order to purchase their products, you will need to go for a skin consultation in-store first. I highly recommend this, because it is an invaluable experience and an opportunity for you to learn more about your skin and what products you need to address your specific concerns. Ella Baché: A lightweight, non-oily purifying treatment lotion that quickly absorbs into the skin to refine and smooth surface texture leaving the skin feeling soft and smooth with a clear complexion. Perfect as a daily moisturiser or a treatment lotion for oily and problem skin. Also excellent for use on thicker skins prone to clogging, congestion and blackheads. I love this stuff! It is extremely lightweight and easy to spread, and absorbs instantly into my skin. My skin is a lot less congested, and I am breaking out a little less, which is great! I do still get a few little red bumps here and there, but I am very happy to share that I haven't had a single case of cystic acne (which I used to get frequently) since I started using this! My skin is also clearer and less bumpy. There is almost no scent with this lotion, so those with sensitive noses need not worry. It comes in an airless pump bottle that dispenses the product smoothly, and of course, who doesn't love the hygiene factor! This lotion retails at AUD 69 per 50ml bottle. I really like what it's doing for my skin, and though it is a little expensive, the bottle lasts long enough, because only a pearl-sized amount is needed per application. Ella Baché: A rich, ultra-comforting and plumping moisturising cream that guards against environmental conditions to protect dry skin from dehydration. It will dramatically improve the skin's texture, smooth fine dehydration lines and have it glowing with vitality. Ideal for dry skins. Another gem of a product. This comes in a jar, and the cream is very thick and emollient. Though the description says that it is ideal for dry skins, I think it works a charm on oily skin like mine as well. This moisturiser helps me keep my oiliness in check and helps my foundation stay on forever! Though the cream is thick, it absorbs like a dream into the skin, leaving no stickiness or gooeyness whatsoever. I have come to realise that this is a quality that is extremely difficult to find in more highly moisturising products. This is one of those creams that sits quietly in your cupboard - no flashiness, no false claims, just doing the job it was meant to do, and doing it well. LOVE this cream! This is a little expensive! It will last you very much longer than the Baume Purifiant though, because so little is needed to moisturise your whole face. It retails at AUD 105 for a 50ml jar. I am very keen on trying more Ella Baché products, to see how well they treat my skin issues, especially the little pimples that keep appearing on my cheeks. I will keep you posted!